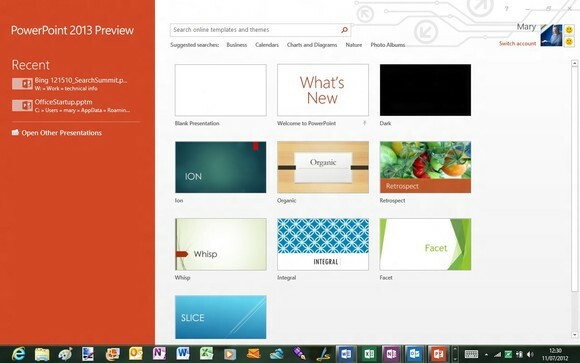 OTE: This review is based on the Office 2013 Technical Preview. Do you feel modern? 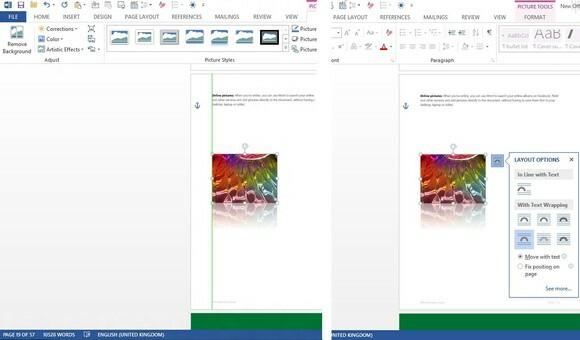 The next version of Microsoft Office gets the Metro treatment, with a touch-friendly interface as well as new features, and goes to the cloud, with subscription pricing, on-demand installation and automatic syncing of settings and documents you save in the cloud – if you want to pay for it that way. So we've taken an in-depth look at what you get and how well the Windows 8-influenced interface works in practice. 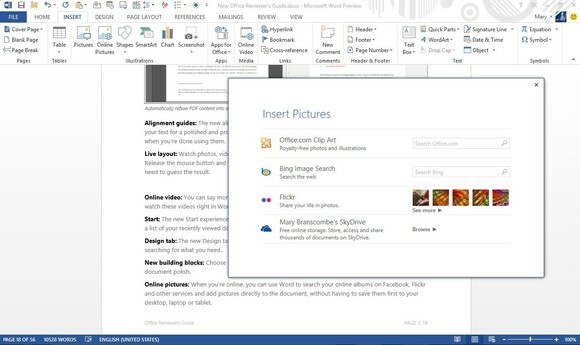 Although the preview suite is called Office 15, individual applications such as Word and Excel get the 2013 tag, so we expect the final release will be called Office 2013. 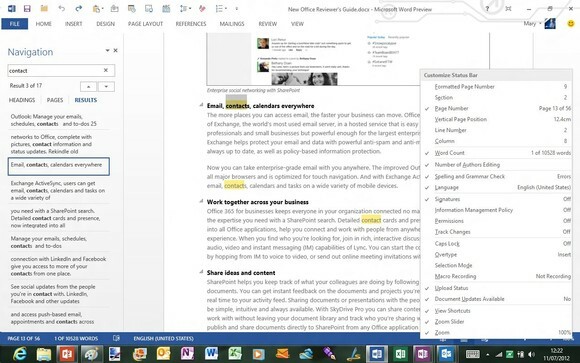 As usual, the technical preview includes more applications and features than you'll get in all the versions of Office 2013: Word, Excel, Outlook, PowerPoint, OneNote, Access, Publisher, InfoPath and Lync – plus the Metro versions of OneNote and Lync. Some of those will come with Windows RT (Word, Excel, PowerPoint and OneNote, plus the two Metro apps), but we're not including those in our Office 2013 review because we haven't spent time using them yet. There are Office 2013 versions of the Exchange, SharePoint, Project and Lync servers as well, which businesses can run in-house or use the cloud versions of (through the Microsoft-run Office 365 service or from the usual mix of hosting companies). 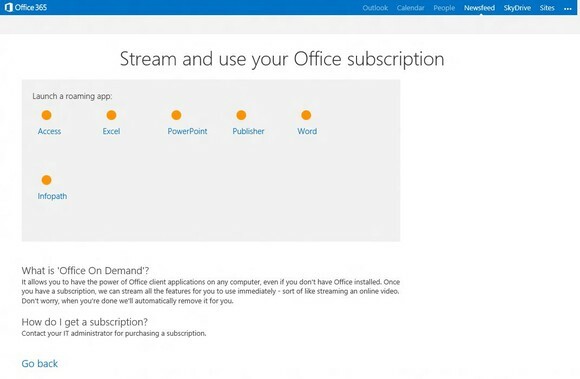 You will still be able to buy Office 2013 as traditional software that you pay for in advance, but you can also buy Office as a subscription, through Office 365. That gets you the full desktop and Metro applications, not just the Office web apps (which also get an update), plus Office for Mac and for any other devices that Office applications are available for (such as OneNote for iPhone, iPad and Android devices). There are four different plans available (they're all labelled Preview at the moment but we expect the names to be final, and we expect these to correspond to the boxed versions of Office 2013). There's no sign of Office Starter, which we expect to be replaced by the free Office web apps. And as you might expect, Office 2013 only runs on Windows 7 and 8, not on XP or Vista. Office 365 Home Premium is the consumer version: you get Word, PowerPoint, Excel, Outlook, OneNote, Access and Publisher, you can install then on up to five PCs at once and you get 20GB extra storage on SkyDrive for saving documents to the cloud. Office 365 Small Business Premium gives you the same applications but with Office 365 accounts instead of SkyDrive, so you get Exchange email, SharePoint document management and Lync video conferencing. 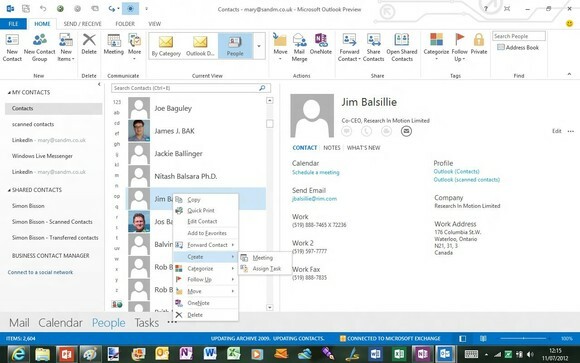 Office 365 ProPlus adds InfoPath and Lync; Office 365 Enterprise has the same applications as ProPlus but the Office 365 accounts you get are the enterprise plan, which has the full version of Exchange, including email archiving. With all of these, you don't have to worry about downloading and saving a large installer for Office. 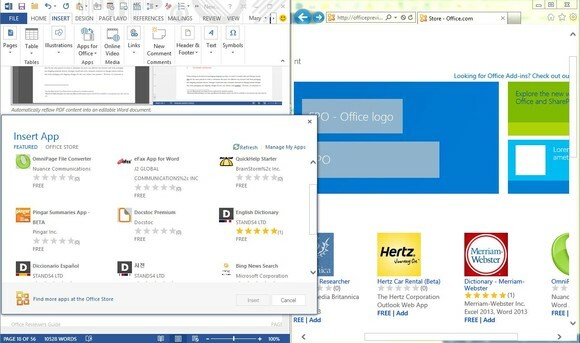 Whether you start the download from the Office 365 site or you try to open an Office document on a PC that doesn't have Office on, the apps stream from the cloud. 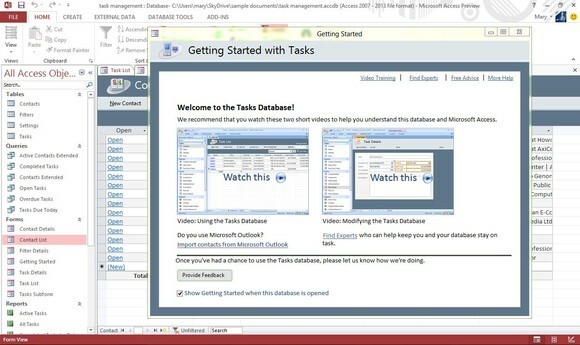 It uses a much improved version of the Click-to-Run virtualisation that Microsoft uses for the Office 2013 trial versions, which enables you to start using the applications just a few minutes after you download them. 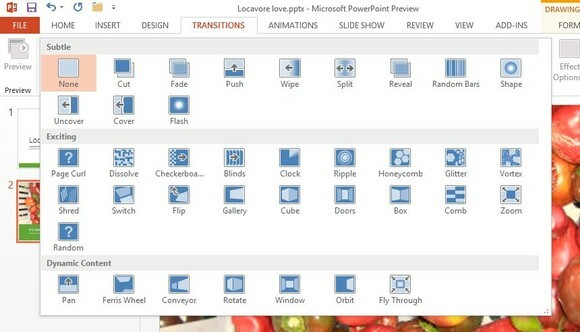 There's a PowerPoint slideshow of new features that opens in PowerPoint while the other applications stream down and you pick options such as the design you want to see in the ribbon. 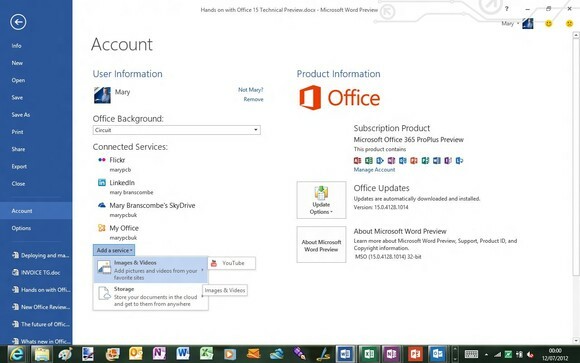 You don't even have to uninstall your current version of Office, and Office 2013 picked up all our settings - from email accounts to custom AutoCorrect entries, Office add-ins and the buttons we'd added to the Quick Access Toolbars. This is your personal version of Office, just a lot quicker. 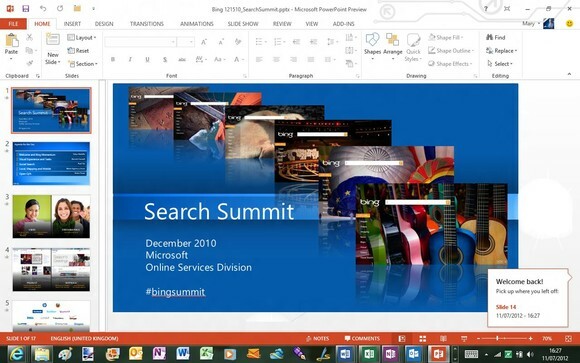 Office 2013 takes the clean, unadorned principles of Metro and applies them to desktop apps. This puts your documents centre stage, with tools such as the ribbon fading slightly into the background. The ribbon looks much more spacious but takes up no more space on screen. Word gets a new design tab on the ribbon, which is a more logical place for the formatting and page background tools previously found on the page layout tab. The layout features are also much improved; you can now embed videos directly into Word documents and have them play, or search your Facebook and Flickr account for photos to place in documents without having to save them first – these are both well designed tools that are easy to use. Getting your pictures in the right place is much easier with the new alignment guides that appear as you drag objects around (so you can see when the object is in the centre of the page or lined up with another element), and the layout options tool that appears so you can set text wrap. The alignment guides make it much easier to tweak Word Art quickly, instead of spending hours adjusting spacing and sizes if the default Word Art layout doesn't fit what you want to show. The improved layout options may be why the new PDF reflow feature works so well. This opens PDF files as if they're Word files – converting the layout so you get a Word document that looks like the original PDF, complete with fonts, layout, images, tables, charts and page numbers and making it all editable. This is fast (for a two-page file it takes only a few seconds longer than opening the PDF in Acrobat Reader) and remarkably accurate. One option, Read Mode, removes nearly all of the Word interface, reflowing documents to fit on screen with thumb-friendly buttons either side of the page. You can choose wide or narrow columns and set the page colour to sepia or even white on black. Tap on pictures, videos and charts to pop them out of the page in a larger window, or collapse sections you're not interested in (you can do that in page layout view as well). But cleaning up the interface also means losing some useful tools; the handle that you can drag in Word to divide the document window into two scrolling panes (so you can see two separate sections of your document on screen at once) disappears, relegated to a button on the View ribbon so it takes twice as many clicks to get the split view. Maybe you won't need it as often with the handles that enable you to collapse sections of your document, but when you do it shouldn't be more work than it used to be. And the AutoCorrect features have disappeared from the menu you get when you right-click a spelling mistake; you have to go all the way into Word's huge Options dialog to add corrections you want to use. The new interface doesn't always make more space for your documents either. 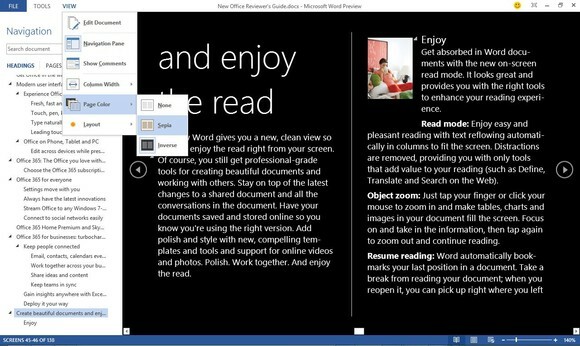 Office 2013 is built for widescreen tablets; when you open Word, the window you get is a little taller and much wider than the default window size in Office 2010 - that's the difference between the 4:3 aspect ratio we're used to and the 16:9 aspect ratio of tablets such as Surface. Those same assumptions show up throughout the interface. For example, task panes are back. In what feels like a flashback to Windows XP, dialogs such as spell check take up a huge slice of your screen. Install a dictionary from the Office Store (a central place to get a range of Office add-ins from Microsoft and other companies) and you get definitions and synonyms for words below the spelling suggestions; useful, but not worth that much screen space. Instead of a small dialog box you could move around the screen and only obscure a few lines of your document with, you now lose a couple of inches of space at the side of your document just to check your spelling or find a reference. This will be great on a touch-friendly widescreen tablet with just one document open and space to spare, but it's a huge step backwards for working on multiple documents on a standard desktop screen. Snap two windows open side by side and press F7 to start the spell check. In Word 2013, on a 12-inch 1024 x 768 screen, the 5-inch snapped window sacrifices 1.75 inches of space to the spelling task pane. Add the navigation pane and you see only a thin strip of your document in between. You can undock the Spelling dialog and drag it around (and Office remembers your preference), but the default is for Office applications to spread out on screen and get comfortable rather than to cram in all the information and functions you're used to in the same small space. Sometimes the space is well used. If you collaborate on documents with others, using tracked changes and comments, the improvements to these are extremely welcome and can save you hours of frustration. Instead of turning the page into a sea of red strikeouts and blue underlines to show deleted and inserted text, there's a new Simple Markup view that shows you the final version of the document with a line in the margin to show where there are edits. Click it to see the details of those changes (which turns on the All Markup view); click it again to hide the changes and keep reading. A speech bubble shows where there are comments to read; click to open a floating comment view that you can drag around the page or switch to All Markup and see the comments in a wide margin at the edge of the document. You can finally leave a reply to a comment rather than just leaving a comment nearby, and you can mark a comment as dealt with; this greys out the comment so it's not distracting, but it's still there if you need to refer back to it later. 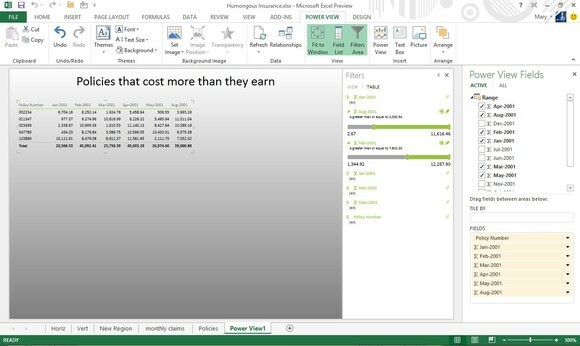 Excel gets the same interface changes as the rest of Office and some of the same features (the dialog for inserting images from the web that's also in Word and PowerPoint and the apps for Office gallery, but not Word's new comment interface). 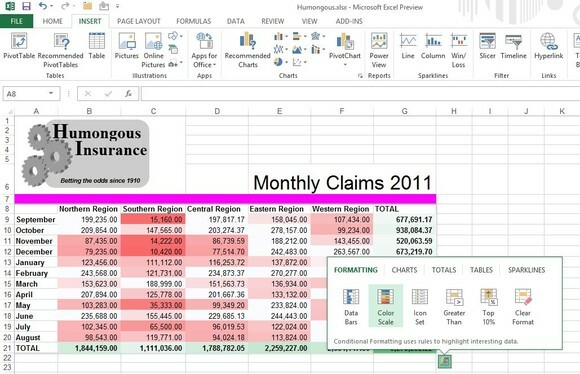 And like Word, Excel offers more help for using existing features. Select a range of cells with numbers and the Quick Analysis tool pops up next to the selection with a gallery of conditional formatting, the charts that show the most information from that specific data, formulas, table formats and in-cell sparklines. Hover over an option and you see it either in your data (for formulas such as average or heat map formatting that highlights the highest and lowest figures) or in a pop-up for charts. The categories are always the same, but the suggested charts change to match the information you're showing – with your live data previewed in the chart and an explanation of why a Clustered Column and Line chart or a Stacked view fits your data best. If the data is complex enough to analyse with a PivotTable, it can build a PivotTable model automatically. 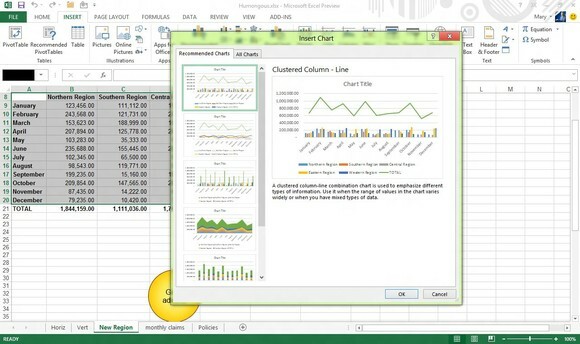 This Chart Advisor comes from Microsoft Research and a prototype appeared on the Office Labs, but it's much more useful to have it integrated with the other analysis tools in Excel. It's a baby version of the intelligence built into analysis tools such as Tableau – it doesn't go as far as suggesting colour palettes for example – but it makes complex tools such as Pivot Tables (possibly the most powerful and least used feature in Excel) far more accessible. And just getting the right chart first time means less time tweaking formatting options and more time making sense of your data. If you do need to edit a chart, the contextual tools that pop up make it faster and easier; you can preview different designs and checkboxes add and remove chart elements or sections of data interactively. 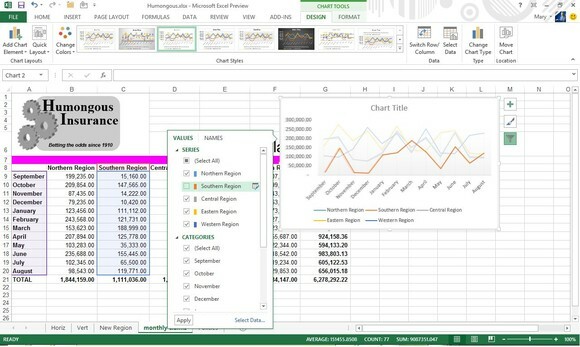 This takes something you've always been able to do in Excel - if you had unlimited patience and unerring accuracy at right-clicking on just the right spot in the chart – and makes it easy and engaging. Change the data that a chart is based on and the chart doesn't just update; it animates to show the change happening. If the new figures are significantly bigger, first the rest of the chart shrinks, then the new bars grow on screen. Update a single figure and the line moves up or down to its new position, so you can't miss the impact. Even as you move between cells or add a figure that changes a formula, there are subtle animations to draw your eye to what's changed or where the cursor has moved to. It's not enough to be annoying, because the animation is less bouncy when the change is close to where you're working and a little more, well, animated, when it's further away. Click a cell and the highlight appears to fly into place, leading your eye there; change or delete a figure that changes a calculation and the result rolls over to show the new figure. This makes it much harder to change or delete information that changes your results without noticing that it makes a difference. Handled badly it could be a tacky gimmick, but done as well as this (even on a PC with basic integrated graphics), it has the same kind of delightful, engaging whimsy as the best of Windows Phone. It's such a simple thing but it makes Office feel alive and responsive - and because you're getting useful information rather than pointless, cheesy effects it doesn't go from engaging to irritating after a week. Even error messages are more useful; drag a cell across the worksheet when you only meant to click somewhere else and Excel gives you a truly informative warning that there's already data in that cell. 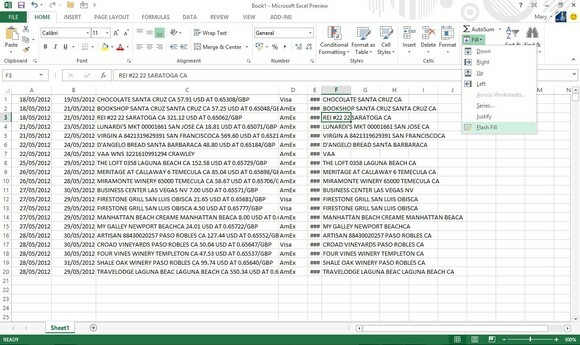 It shouldn't be a breakthrough, but in the past Excel has been more prone to bald refusals to save or confusingly cryptic errors – this is, mostly, a new and friendlier Excel. If you want to dig further into your data, there are several new tools, including a Timeline slicer that organises data by date so you can filter down to a specific period or jump through figures month by month to see the differences. There's a new add-in to look for errors and inconsistencies between worksheets and Power View – which used to be a Silverlight-based web tool for exploring and visualising data that you could use with SharePoint or save as PowerPoints – is now in Excel where it belongs. It's not relegated to a separate window; when you insert a Power View you get a new tab and the tools for pivoting and filtering data, plus simple layout options. Of course the first problem is getting data into Excel to work with. If you're trying to paste in data from a badly formatted report or an online credit card statement, the new Flash Fill feature is vastly easier than trying to work out how to split data into columns in just the right place. In fact it's so good it feels like magic. Paste in the messy data, then start typing the piece of information you want to extract, such as the date or the name of the company you made the payment to (without the unwanted details such as the business number or foreign currency). After you type a couple of examples, Flash Fill uses them as a template and works out the right pattern – and fills in all the other entries for you. You can extract multiple patterns from the data, so you can get the date, the business name, the amount, all by typing a couple of examples. Again, this is a feature from Microsoft Research, using machine learning. It's the kind of artificial intelligence that websites such as Tripit use to scrape information out of emails and web pages. It's enormously powerful, and it's blissfully simple to use. And it's not often you can say that about Excel. The uncluttered new interface works very well in PowerPoint; again the tools fade into the background so you can concentrate on your document. Like all the Office 2013 applications, when you open PowerPoint you don't go straight to a blank document; instead you get what's almost a welcome page with a list of recent documents and thumbnails for templates and themes (and a blank document if that's what you want). Often that's less daunting than starting with a completely blank document. You can search the library of free templates on the Office site from here; the results come up in what Microsoft used to call the 'backstage' view – the full-screen File menu – and you can preview the layout, filter the results by various categories and keyboards, or even look at the templates for other Office applications. Many of the templates have multiple colour themes to choose from; whichever one you pick to start with you can switch to the other variants later. 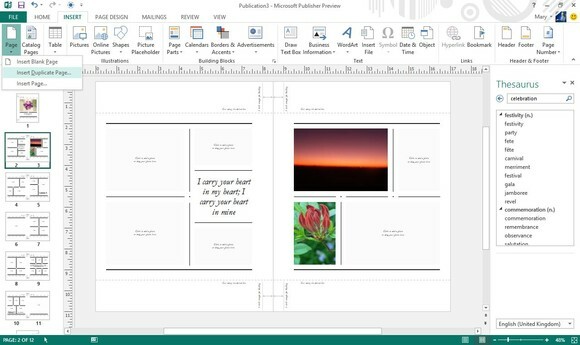 As with the rest of Office 2013, a lot of the new templates are optimised for widescreen aspect ratios, like the 16:9 tablets Microsoft hopes you'll buy to run Windows 8 on. If you're going back to a document you've worked on before both PowerPoint and Word make it faster to pick up where you left off; click the pop-up window to jump to the last slide or page you were working on. 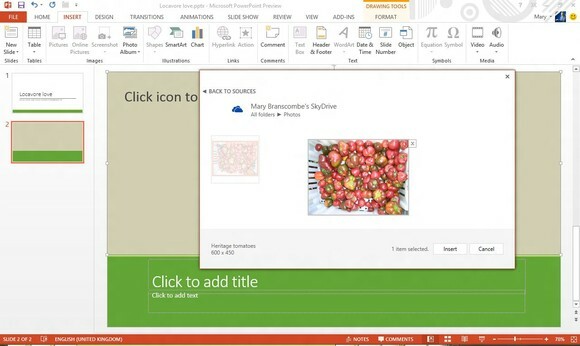 For layout, PowerPoint has the same tools for inserting online images and videos as Word. 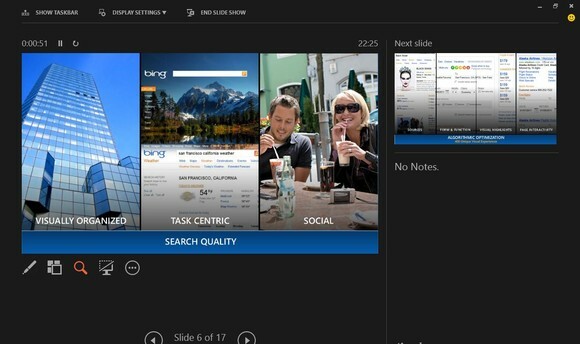 These are much easier to use than the PowerPoint 2010 video options; a single friendly dialog enables you to search YouTube or Bing for videos, browse your SkyDrive and local system for video files or paste in the embed code from a video's web page. We did have some problems playing videos in presentations, but generally it works better than PowerPoint 2010's video embedding, even though we had to choose YouTube's 'old' embed format if we were pasting in the code rather than searching through the PowerPoint interface. This is one place where putting controls into task panes works much better than having an on-screen dialog box; it's much easier to work with the border styles, layout effects, positioning options and video correction tools in a task pane than in a dialog with 12 tabs that sits right on top of the video you're trying to edit. There are also 'quick' formatting tools that appear next to selected objects, much like the Quick Analysis tool in Excel, putting the tools you need the most next to the object you're working on. If you work from the ribbon, look out for more descriptive tooltips with helpful – if quirky – explanations of what the tools are for; the shapes tool now promises "those little thought bubble things". Office is definitely lightening up. For positioning, PowerPoint not only has the new green alignment guides that show when you have an object at the edge or centre of a slide. It also has extra 'smart guides' that show when you're aligned with other graphics, and when objects are evenly spaced across the page – these are in addition to the alignment guides on smart art shapes, which now show both horizontal and vertical alignment instead of just one at a time. You can set your own guidelines on master slides; for example if you have an image in the background of certain slides that you want to line up with. There aren't any new shapes to put in presentations, but you can combine two shapes into one – cutting one out of the other, breaking them up into pieces, turning the space between them into a shape or just gluing them together. That enables you to create new shapes far more precisely than trying to draw them out. And there's finally an eyedropper tool for selecting colours from existing objects (although only within the same presentation, not in other applications or even other PowerPoint windows). PowerPoint gets Word's friendly comments as well, complete with replies; again, this makes good use of a widescreen resolution. That's going to be useful when the next update of the PowerPoint web app adds the ability to edit a presentation in the web app and the desktop version of PowerPoint at the same time. When it's time to give your presentation, the presenter tools have some great new features, such as a thumbnail grid for reviewing all your slides that only you can see. You can pinch to zoom in and out of this; it's also handy for jumping ahead to a later slide without clicking through one at a time. You can also zoom in on a specific slide in the presentation if the audience needs to see fine detail. You can see a preview of the next slide, and your presenter notes, which might stop people cramming pages of text onto a single slide and then reading it all out loud very slowly (we can only hope). You also get a counter for elapsed time for the current slide and the whole presentation, plus the current time, and tools for drawing on the slides or showing a fake laser pointer to highlight things. And you don't have to have a second monitor or projector connected to see the presenter tools, so you can practice running through the presentation complete with your tools. 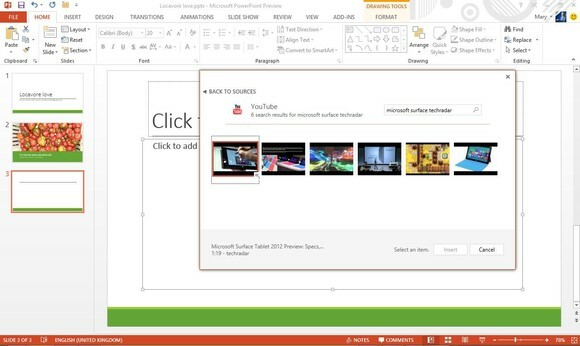 Office 2013 is designed to showcase Windows 8 and the touch features (we expect the same to be true of the Windows RT versions). Even the desktop apps are ready for touch. Press the Touch Mode button on the quick address toolbar and the layout of the interface changes, taking away some of the detailed commands and giving you more space to touch buttons. In Outlook it also brings up a bar of five frequent commands about where you'd be holding a tablet if you have it in landscape (reply, delete, move to folder, flag and mark as unread). There are some delightful touches such as using pinch-to-zoom in the Outlook calendar to zoom between day, week and month views. Finger right-click also works better in the desktop Office 2013 apps than perhaps anywhere else in the Windows 8 desktop; if you're writing an email or editing an appointment, press and hold and instead of a context menu you get a finger-sized bar of handy commands that includes the useful options from the mini Office bar such as bold and bullet points and adds Cut, Copy and Paste right where your finger already is. Outlook has other handy ways of enabling you to work right where you are. Reply to an email using the button at the top of the message and you're typing in the main Outlook window, above the message you were reading; you can pop it out into a separate window if you need to, but this is a clean way of working. If you click away from your reply it's automatically saved into the draft folder and the mail you were replying to gets an orange DRAFT label on it (making that stand out is the best reason we've come up with for the signature colour of Outlook changing from orange to blue). Fans of Windows Phone will be delighted to see the All and Unread buttons in the inbox; you can quickly jump between all your messages and just the ones you need to deal with. With all these handy tools you can probably keep the ribbon in Outlook minimised a lot of the time, making room for more messages on screen. In fact, when you minimise the ribbon you get extra buttons, such as one to make a new appointment in the calendar. The defaults when you set up an Exchange account are slightly different; you still get cached mode (so Outlook keeps copies of your mail from the server in a .OST file) but the default is to only download the last 12 months' worth of mail. There's a slider in account settings to control that, and you can still have all your mail. If you don't, then you see another Windows Phone feature; when you do a search there's a link to search on the server if you haven't found what you're looking for. Metro is also a great design for the address book; images from social networks are automatically used for a thumbnail view and you can see and edit contact details without having to open a separate window. 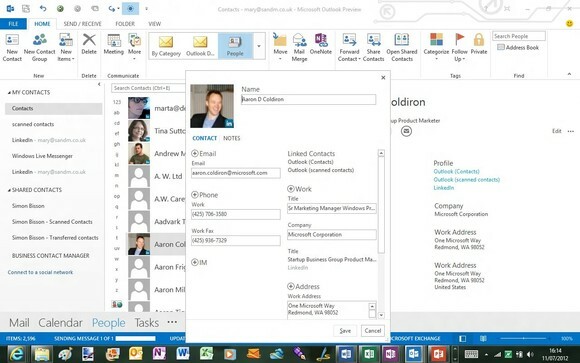 Like Windows Phone, Outlook automatically links together any contacts it believes are the same person, and adds their details from LinkedIn, Facebook, Windows Live Messenger and any other social networks you connect to Outlook. Unlike Windows Phone you can't make links yourself, or change any you don't like; this might change in later builds, and we didn't find any contacts linked together that weren't the same person. This is a great way of getting Outlook to clean up all the duplicates that accumulate in your address book over the years, as well as seeing social network updates next to all the other details you have about people. 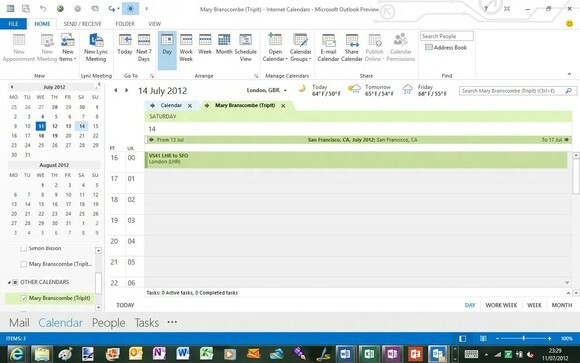 If colleagues are sharing their calendars with you, you can also see whether they're currently free (and for how long) and Lync is integrated so you can start a video or IM conversation anywhere you see someone's name. You swap between the mail, calendar, people and task windows (and the seldom-used notes, folders and shortcuts) using Metro-style footers rather than the current space-wasting buttons at the side, but the new Peeks mean that much of the time you won't need to. Hover your mouse over the word 'Calendar' and you get a pop-up preview of today's appointments and tasks; click a day to see what you'll be doing. Hover over People to see frequent and favourite contacts and over Tasks for your to-do list and flagged emails. This is just as convenient as having the details in the calendar bar on the right of the window all the time but less distracting (you can pin them back there if you want, for example if you like to drag mails onto the calendar to create appointments). If you do make it all the way into the Calendar you'll see a three-day weather forecast at the top of the screen (as long as you're online – it's not cached for later in case it gets out of date). Microsoft tells us this will pick up the location of your appointments and show weather for the right city if you're travelling, but we haven't seen that happen yet. Again, this is the Metro style working well. On the other hand, Outlook is where the chunky Windows 8 notifications are the most intrusive; you get one for every new mail and they stack from the top-right of the screen down, rather than staying in the same place. If you open Outlook after a long flight, your screen fills up with multiple notifications. And while they fade away on their own, we didn't find a way to dismiss all of them at once, so you have the choice of waiting or playing whack-a-mole. Even more annoyingly, you can no longer delete a message or accept an invitation directly from the pop-up notification. 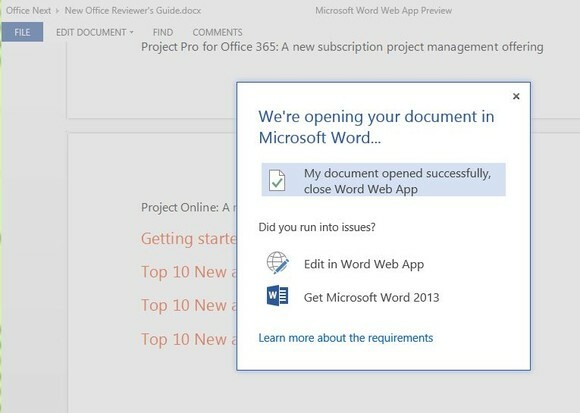 Maybe it's just a beta issue; if not, it's another place where Office 2013 values clarity over productivity. You can at least dismiss multiple alarms at once; these pop up in the familiar alarm window even on Windows 8, rather than as notifications. 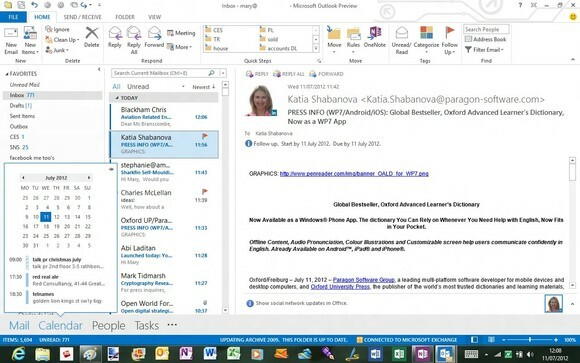 This is practically the only place in Outlook where the Metro interface isn't a clear improvement and the Office team has done a far better job of taking the best features from Windows Phone than the Windows Live team has with the Windows 8 People and Mail applications. 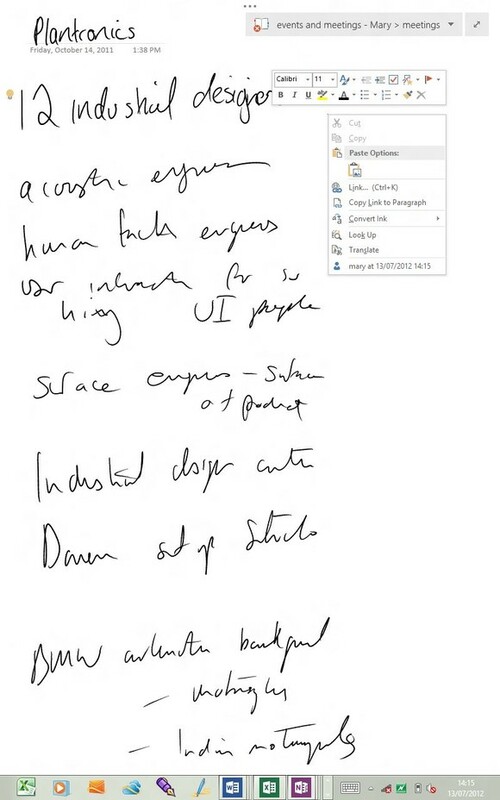 OneNote 2013 is the best-hidden secret in Office; a note taking application that's easy to use, organised like a paper notebook and crammed with features. 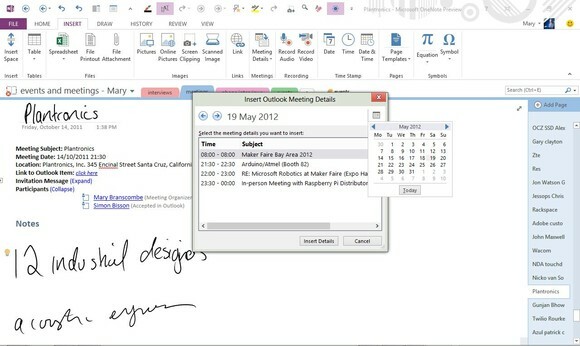 You can link notes to the original document, or a meeting from your Outlook calendar (handy to get the agenda or job titles and the correct spelling for everyone's names) or send information from any file or web page into OneNote. 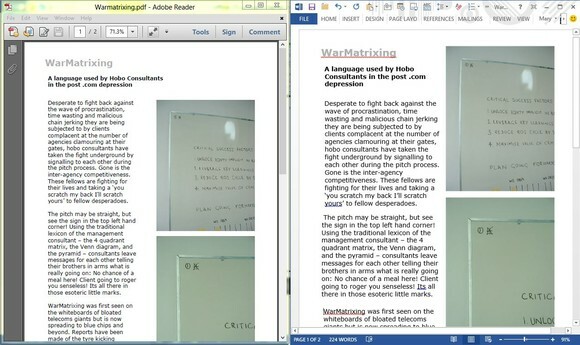 Insert an image and any text in it is OCR'd automatically. You can take audio and video recordings of meetings and have your written or typed notes time synced to them. OneNote now enables you to embed even more information – embed Excel and Visio files and you can see the live content in your notebook. The table tools are much better than in previous versions, and you can turn a table into an embedded Excel spreadsheet to get more formula options. 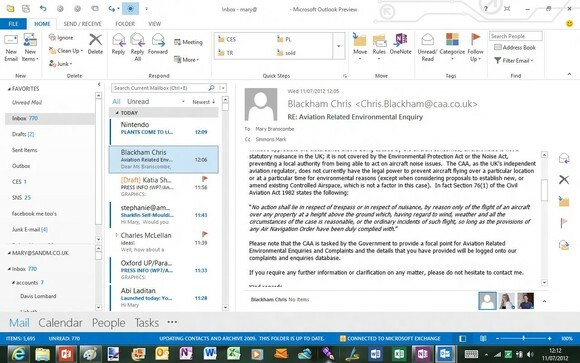 All the Office 2013 applications have the Touch Mode button, as well as a Full Screen Mode button next to the minimise and maximise buttons, which hides the ribbon, status bar and most of the rest of the interface to enable you to concentrate on your document. OneNote has an even more extreme view that hides everything but the notebook picker and the button to get the rest of the interface back, leaving you the full page to take notes on - ideal on a tablet. Not everything makes sense in the interface. 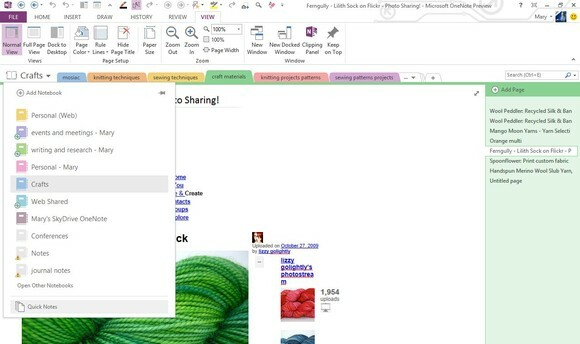 OneNote's handy screen clipping, Send to OneNote and quick note features are combined into an odd pop-up window that showcases these useful options but proves intrusive once you know what they are and how to get to them, and the pop-up doesn't even close properly. It also commandeers the Windows-N shortcut for making a new quick note (renamed from side note because it's not really at the side), so you have to press Windows-N N. Thankfully Windows-S still works for clipping information from anywhere on screen into your notes. It's hard to show new users an important feature without irritating experienced users by getting in their way, and we hope Microsoft adds a way to turn this interface off. The detailed options for choosing where different types of information go when you send them to OneNote are very welcome, though; you can set default folders and other options for email, web pages and other sources individually. 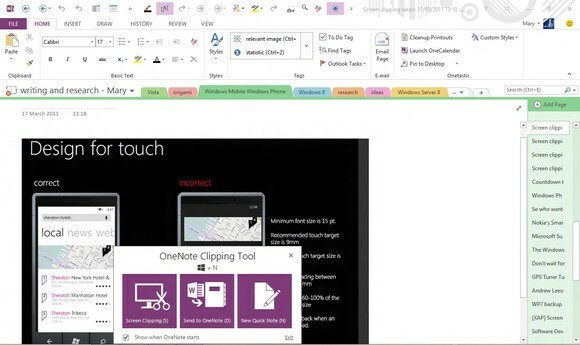 OneNote was the first application to effortlessly sync between PCs, onto SkyDrive and the OneNote web app and to a wide range of smartphones. That now includes Metro; Office 2013 includes a full Metro app – rather confusingly called OneNote for Windows 8, which seems to be how Microsoft is now labelling what used to be called Metro-style WinRT apps. This is the most complete and powerful Metro app we've seen so far, with a large proportion of the OneNote tools, and even more touch features. Select text in the OneNote WinRT app with your finger and you get the new radial menu - the finger equivalent of the mini Office bar that fades into view when you select text with a mouse, and even easier to use than the finger-sized version you get in the Office 2103 desktop apps. You can tap to choose a pen colour, then swipe round to pick the shade you want; tap to change text size and swipe round to pick how large you make it. There's an undo button and a button to apply tags. This puts the most useful OneNote features quite literally at your fingertips, with the radial menu appearing on the right of the screen, where your thumb is if you're holding a widescreen tablet in both hands (as you might notice, Microsoft has definite views about how most people will hold tablets). You might have seen something in the Microsoft Research Inkseine prototype app; this takes those ideas and makes them so easy to use it will give you a reason to like Metro. And all your notes are there, in Metro and desktop views. This should help OneNote come out of the shadows and get the recognition it deserves. Access continues its journey to being less a database and more a database app development tool. You can still create both desktop and web apps - the latter now look like Metro applications – as well as SharePoint lists. There are few new features beyond the new themes and templates, and the same clean Metro interface as the rest of Office. Publisher gets the same tool for inserting pictures from online services as Word and PowerPoint (but not videos, even if you're creating a web publication), and the same task panes and formatting tools, as well as the rest of the Metro interface. It even has Touch Mode, which is probably more useful for checking publications than laying them out. Given that it already had features ranging from a full set of alignment guides to support for OpenType stylistic alternates to 'building blocks' for creating common objects such as pull quotes, banners, calendars, adverts and more, it's still a powerful DTP package that's easy to use. Oddly, Publisher is one of the last applications to keep the small floating spell check dialog. With a new version of Office, the first question that always springs to mind is whether there is anything new that Microsoft can add to a mature and powerful productivity package. Word is a product with 20 years of features and being able to insert videos and online images is more a matter of catching up with the times than a major new feature. But PDF Flow and the massive improvements in tracking changes and comments in documents are hugely useful. 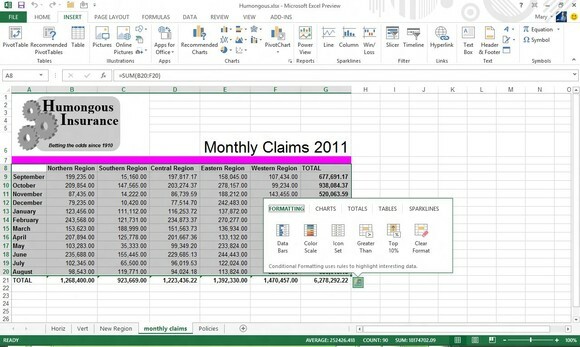 From little touches such as animating calculations as they change to new tools that help you get the Excel chart that shows what's important in your data, from in-place replies in Outlook to change tracking and commenting in Word that doesn't make your document look like a battlefield, the desktop apps get worthy new features. 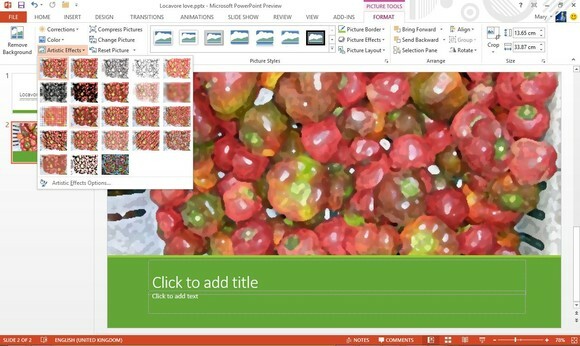 We like the new tools for designing presentations in PowerPoint. We like the new presenter tools even more. 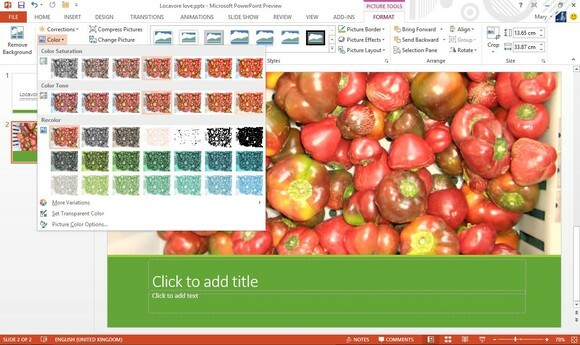 Whether you create presentations or just sit through them, PowerPoint 2013 should make your life better. And OneNote Metro is the first real Metro application; it dismisses arguments that Metro is only good for toy apps and games, with a powerful app that has most of the key features of the desktop version and shows how much you can achieve in the Metro interface with the WinRT framework. If you switch PCs often, you'll love the fast streaming install. Sometimes cleaning up for Metro means dumbing down; advanced features such as split view and Autocorrect are now harder to use, which is a step backwards not forwards – and strangely at odds with the way other powerful features such as Pivot Charts are exposed. There are a few too many ways to get rid of interface elements; hopefully those are the kind of rough edges that will be tidied up before release (and the mismatch between the clean Metro windows and the Aero Glass look of Windows dialog boxes will go away with the RTM of Windows 8). We had very few problems with performance or reliability, but an incompatibility with SharePoint 2010-hosted sites stopped Outlook from syncing mail until we removed the SharePoint connection. As always, pre-release software isn't necessarily up to full-time use. 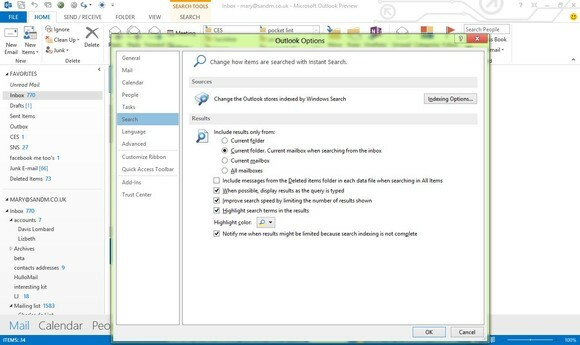 If you look at a list of the new features in Office 2013, you might not see any one feature you can't live without, but after even a few days of using the new applications there are plenty of features you'll miss. This is another big advance in usability, combined with some extremely clever new tools. There are features for power users, especially in Excel and PowerPoint, and there are far more features that either make it easier to use the power of existing tools or give you whole new ways to achieve what you're trying to do without having to be an expert. 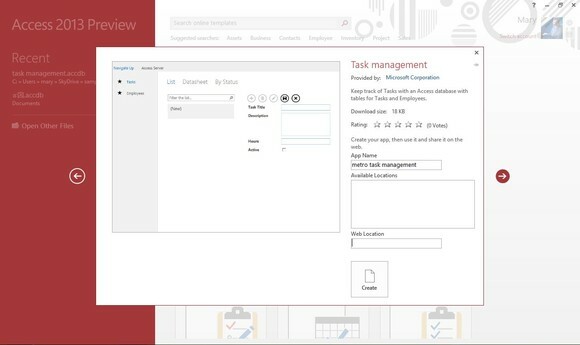 And while we'd like to see more true Metro applications (Outlook that you can search from Metro and keep up to date during Connected Standby needs to be high on the agenda). Mostly Office 2013 gets the right balance between streamlining and oversimplifying; there are some places where we miss specific power user options, though. But the great thing about a subscription service is that you won't have to wait as long to get updates and improvements. GOOGLE LAUNCHED THE SMS CHANNELS IN INDIA.